Chefs Feed is a wonderful new iPhone app for foodies with a fresh concept. You get recommendations from over 100 real life chefs on what dishes they like to order at their favorite restaurants around the US. You can imagine as a chef, these people are in the know on what is good cuisine, what dishes have extraordinary qualities and are able to suggest some interesting hidden gems. It’s almost like asking a superstar DJ about his secret musical influences. So you might end up with some oddities here and there but overall, the Chefs Feed iPhone app is a groundbreaking idea and is really well executed. The app is free and has no ads, so you have nothing to lose. You’ll learn not only about good food, but also get introduced to chefs in your area. Chefs Feed features big shots like Mario Batali, Wolfgang Puck, and Thomas Keller. And you’ll also find some local favorites. The app is currently live and covers New York, San Francisco, Chicago and Los Angeles, with more cities on the way like Seattle, Washington DC, Boston, and Philadelphia. The main app screen has 3 ways to explore. Use the City’s Best Chefs menu to browse the list of chefs alphabetically. The app uses your location to automatically place you in the right city but you can jump to a different location if you want. To view a list of dishes by name, tap Their Favorite Dishes and browse a large list of menu items recommended by chefs in your city. Both of these lists can be filtered down by typing in any keyword, and there is a way to filter the results further by choosing the price level, open now, cuisine type, and neighborhood. To get a list of nearby suggestions within a few miles radius tap the Feed Me Now link and start exploring. 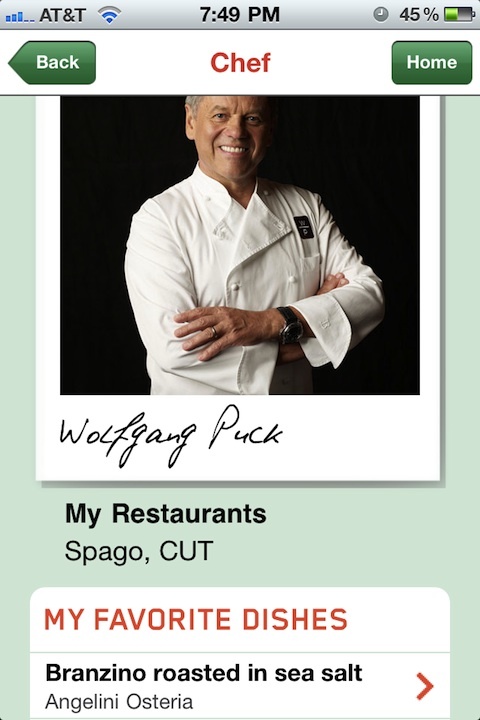 Each chef has their own page where you’ll find a nice photo of him or her, his or her restaurant(s), their stats and awards, and a list of their favorite dishes. You can’t save a chef as a favorite. Each Dish has its own page as well. Here you’ll see what restaurant serves it, which chef recommends it, and you can save the dish in a few ways. You can pick Ate It, Rate It or Plan It for any dish. Once you plan a dish, it will be saved to an itinerary page and you can get to it quickly from the Messages section. Finally, each restaurant also has its own page where you can view it on a map, see its address, call the phone number, and see a list of dishes recommended there. The app works both while you’re online and offline in airplane mode which is great. The design uses green restaurant style docket book paper which is very clever. Navigation is fast except for a few seconds wait while loading large lists. The layout is easy to read and searching using keywords is efficient. For example you can just type in Pizza or Burger and narrow down to a list of the recommendations instantly. A couple of things missing are the prices for the dishes and the ingredients for the dishes. Each chef does write a short sentence or two that describes the dish which sometimes contains its ingredients, although mostly are about its flavors. It would also be really helpful if the app had photos of these mouthwatering meals. Another useful feature would be to have recommendations for wine, beer and cocktail lounges, and possible pairings. Finally, it would be nice to have OpenTable tied into the app so you could make restaurant reservations on the fly. 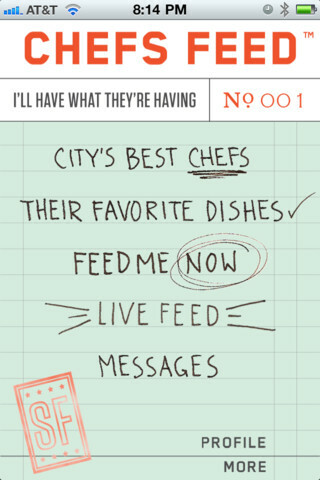 Overall, Chefs Feed is a must have iPhone app if you live in a large metropolitan city in the US and are at all serious about eating good food. It’s like having one hundred chefs as buddies available at all times helping you find some incredibly tasty dishes. Grab Chefs Feed now and make it an appetizing weekend. AppSafari review of Chefs Feed was written by Joe Seifi on September 30th, 2011 and categorized under App Store, Featured, Food, Free, Local, Reference. Page viewed 4332 times, 3 so far today. Need help on using these apps? Please read the Help Page.